I'm a visual artist, a mother, wife, and writer who makes paintings and antique inspired dolls. 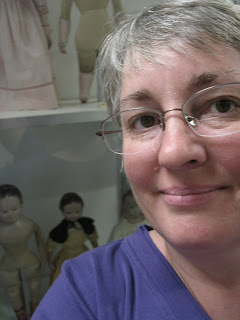 I am the writer of the Izannah Walker Chronicles, MAIDA Today, and the leader of the MAIDA Dolls Group. I'm intensely interested in how things work, and love learning something new. I love reading about and researching family history. I enjoy thinking up strange things that sometimes never make it to reality. But they feed other ideas. As you can see, I enjoy a lot of things, and I think that is a great gift! I have always drawn and created things.... when I was a little girl I enjoyed sewing and drawing and making diaramas. I used to pull rocks out of Cold Stream Pond, and look for the shape of things in each one. I studied art in high school, and in college studied to become an elementary school teacher. I later continued studies in art Montserrat College of Art. My life was oriented around raising young children for a time. Now as they are growing I can direct more of my energies into art-making. I love painting for painting's sake, whether in an abstract mode or figuratively. I also enjoy making creations that are reminiscent of the folk art of past times. I've make both fine art and folk art, as I think they inform each other. 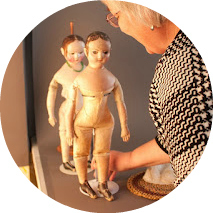 My first pattern was based on Izannah Walker's original antique dolls and have had an incredible experience teaching my first online class - the Izannah Walker Workshop. I enjoy making my own work, but the sweet spot for me is designing a pattern that can be a springboard for others' creativity. That's the teacher in me, that loves to see people learn something new and grow in their skills.